Repert. Spec. Nov. Regni Veg. 30: 55; et in Repert. Spec. Nov. Regni Veg. Sonderbeih. C, t. 26 (1932). Lobivia chrysantha var. hossei (Werderm.) Backeb. Echinopsis jajoiana f. cristata hort. Lobivia jajoiana f. cristata hort. Lobivia jajoiana var. fleischeriana Backeb. Lobivia jajoiana var. nigrostoma (Kreuz. & Buining) Backeb. 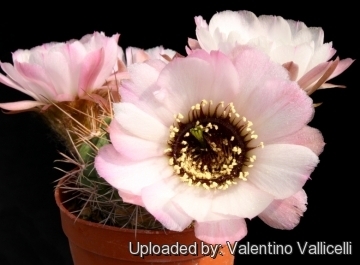 Lobivia vatteri var. robusta Backeb. 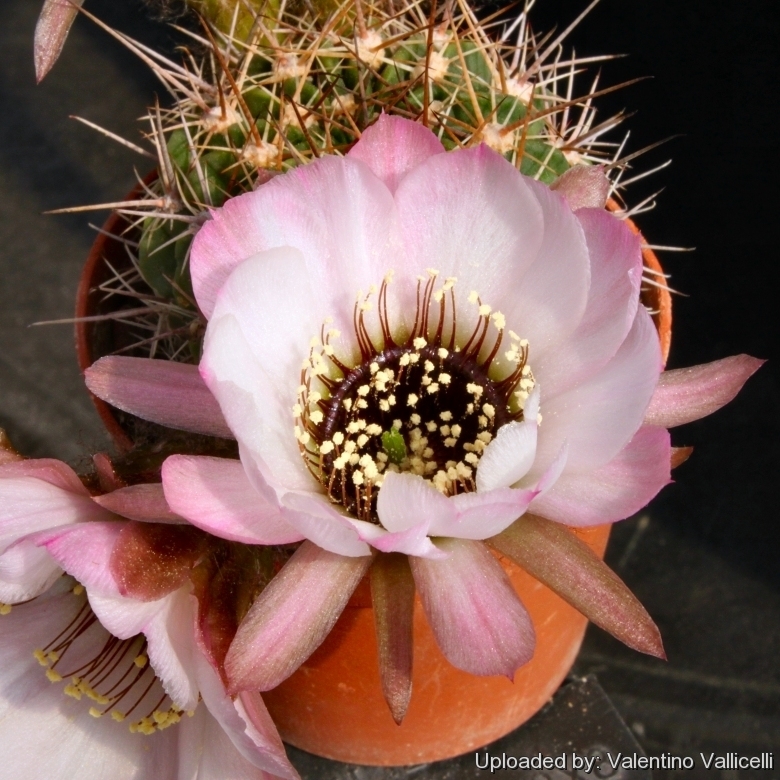 Description: Echinopsis jajoiana cv. Anemone best known as Lobivia jajoiana cv. Anemone is one of best Lobivia cultivars very priced for its unique bicoloured flowers, pale pinkish-white with a contrasting very dark purple-violet to black throat. It is extremely attractive. Habit: It is a small geophytic cactus that usually grows solitary, but given the best conditions may form small groups. Stem: Flat globose-spherical, egg-shaped, then elongate as they ages, soft, up to 50-60 mm in diameter, grey-green. The crown is slightly depressed and covered with whitish wool. Ribs: 10-14 compressed, straight running downward or spiralling and divided into slanting tubercles 10 mm long, chinned and keeled below, whose arrangement creates the impression of a wavy line. Areoles: Oval, 3-4 mm long, white-tomentose. Of different length, usually straight or slightly bent, directed upward, dark brown to blackish in youth, later grey. Radial spines: Approximately 10 or less, about 1 cm long. Central spines: 1 to 3, strong, dark, frequently red; the upper spine usually attains a length of 3 cm and is often hooked and thickened basally (but sometime the longest of them may reach the length of 4-6 cm). Flowers: Arising from the basal tubercles on the side of the plant, bell-shaped, fragrant, about 50-70 mm long and in diameter, ovary and tube grey/green with violet-brown scales and grey wool, outer perianth segments lanceolate, grey pink with a darker median strip, inner perianth segments spatulate, wavy, very pale pink to almost white with tips suffused with pink, which contrats with the dark purple-violet to black hymen (or throat ring of the flower), which is thickened at the edge and glossy. Filaments black, anthers and pollen pale creamy-yellow. Style and stigma lobes green. Fruit and seed: As in the other varieties. 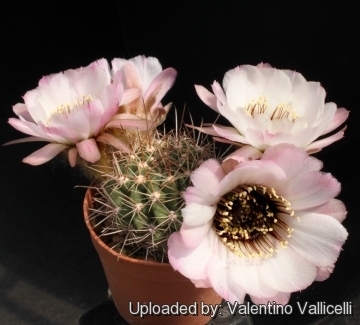 Remarks: Similar flower colours has been inherited by some Chamaecereus hybrids too. Echinopsis jajoiana (Backeb.) hort. ex R.Blossfeld: Flowers colors is very variable, comprising yellow, orange vine-red and violet. All of them have in common that the hymen (or throat ring of the flower) is always of a very dark purple-violet to black, thickened at the edge and glossy. Echinopsis jajoiana f. cristata hort. : Crested form. Echinopsis jajoiana cv. Anemone: Plant with Anemone like-flowers, the petals are pinkish-white with a very dark purple-violet to black contrasting throat. 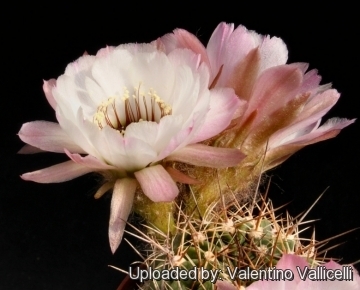 Echinopsis marsoneri Werderm. : Flowers vary from yellow to orange, tomato-red, vine-red and also happening through all the imaginable tones of violet and have a darker contransting orange, red, brown or black throat. Lobivia jajoiana var. aurata Rausch: has globose-spherical stems up to 50 mm in diameter and often violet tinged. Ribs 11, radial spines 2-3(-4), central spines 0-1. Flowers golden to orange, with a purple-violet to black throat. Distribution: Jujuy, Punta Corral. Lobivia jajoiana var. elegans Rausch: has about 16 ribs, 8-14 radials and 1 central spine. Flowers ochre orange to dark purple-red with a glossy purple-violet to black hymen. Distribution: Jujuy, west at high elevations including Tilcara. Lobivia jajoiana var. nigrostoma (Kreuz. & Buining) Backeb. : has yellow flower with the hymen always of a very dark purple-violet to black. Spines are not hooked, needle-like, rather long and not thick. Stems are bluish-green as in the type species. Distribution: Jujuy, Argentina. Lobivia marsoneri var. iridescens (Backeb.) Rausch: has yellow blooms with orange to red to brown throats. Distribution: Jujuy, Argentina. Cultivation and Propagation: It is a summer-growing species that offers no cultivation difficulties and regularly shows its small greenish flowers if we provide an adequate winter rest period. Soil: The substratum must be very porous, slightly acidic, with good drainage. Watering: Water regularly from March till October (but do not over-water), and keep perfectly dry in winter, at temperatures from 5 to 15 degrees centigrade. In the rest period no high atmospheric humidity! !Care must be taken with watering as they tends to become swollen and untidy in growth habit if given too much water and shade. Exposition: They require as much sun and light as possible, and pure air availability. Tends to bronze in strong light, which encourages flowering and heavy spine production. Hardiness: It is quite frost resistant if kept dry (hardy to -5° C or less for short periods of time) Keep drier and cool in winter. The fluctuations of temperature between the day and the night (especially the temperature reduction at night) and fresh soil, greatly contribute to the health of plants. They cannot tolerate stagnant heat. Propagation: Propagate by seed or shoots. Seeds germinate in 7-14 days at 21-27° C in spring, remove the glass cover gradually as the plants develops and keep ventilated, no full sun for young plants! The seedlings should not be disturbed until they are well rooted, after which they can be planted separately in small pots.